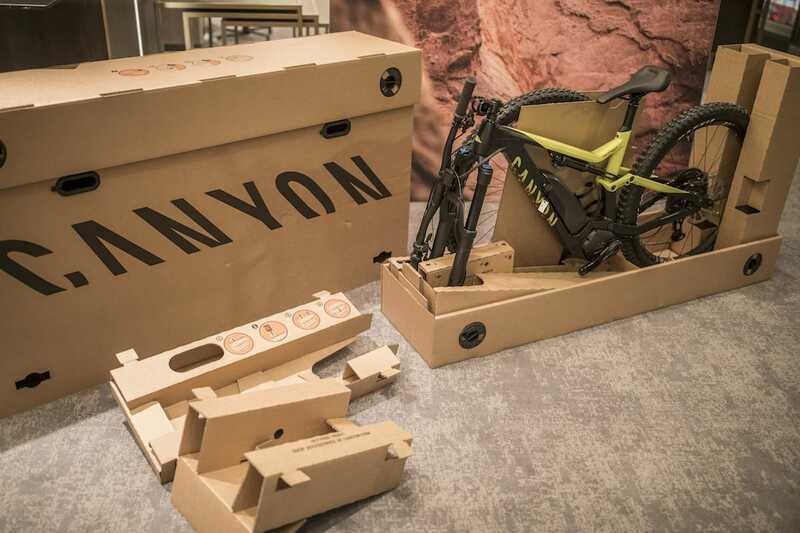 In huge news from the German direct-to-consumer brand, Canyon is launching its first e-MTB. Called the Spectral:ON, this is an e-bike that has been a long time in the making, and Canyon is very, very excited about it. 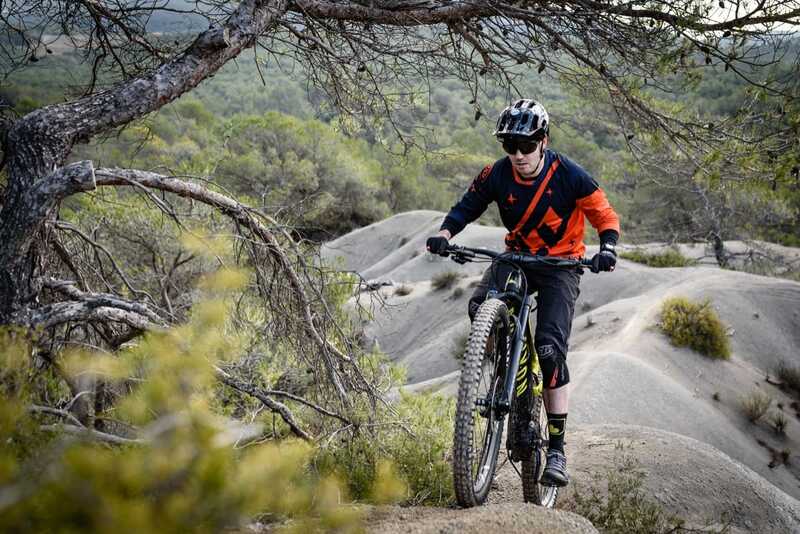 We sent Dean over to the launch to check out the new bike and get it dirty on some technical French singletrack. Over to Dean! Touching down in the French Mediterranean city of Nice to be greeted by blue skies was a delightful contrast to the water-logged trails and long winter of dampness back home. This change got me worried as my pale skin hasn’t seen the big ball in the sky for what feels like an eternity and I didn’t pack any sun cream. Despite what the weather had me believe this trip would be far from a vacation. After all, I was here to witness the unveiling of a new bike from Canyon. 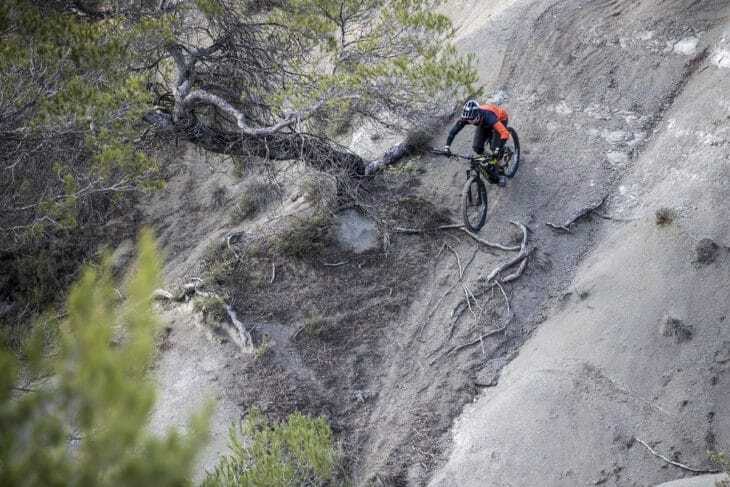 It is no coincidence that this region is the home to the living legend, three-time World Champion mountain bike superstar, all round nice guy and our guide for the launch, Fabien Barel. With Fabien being a local he knows all the trails that are perfect for putting these bikes to the test. 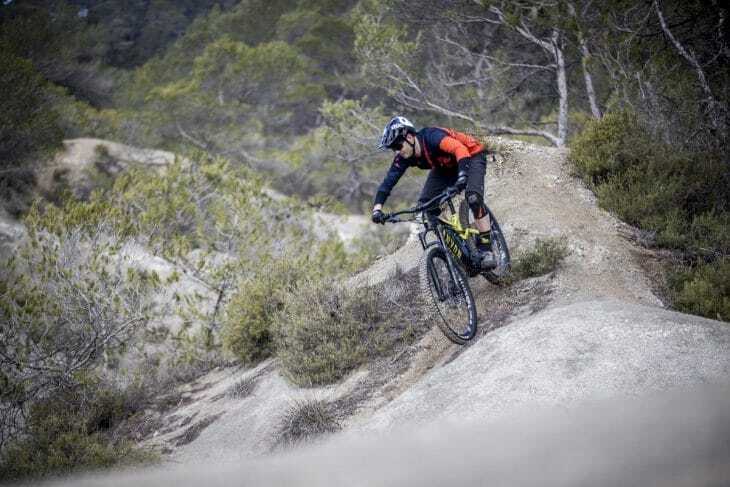 Not just one of the world’s most talented riders, Fabien also holds a wealth of knowledge of bike design and is a crucial member of the Canyon team with mountain bike development since 2013. The launch would be a busy affair, with a big turn out from the European media and a small army of representatives from the Canyon factory in Germany. The fact that Canyon sent so many people to the launch including designers, engineers and product managers laid way to just how important this new project is to the brand. You could accuse Canyon of being just a tad late to the whole e-Party, but then again, this is a German brand that doesn’t like to rush things. With time on its side however, and having had plenty of opportunity to assess all the viable motor and battery systems on the market and how everyone else is doing it, Canyon decided it was ready to enter the e-MTB party with its new Spectral:ON. The new Canyon Spectral:ON. Copyright: Markus Greber. 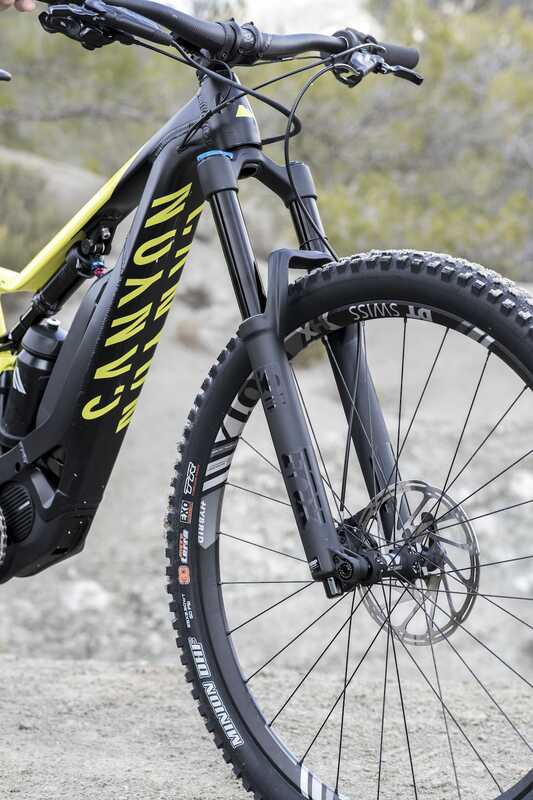 Although the Spectral name is familiar to the world of mountain bikers, let it be clear that this is a completely new design from the ground up. 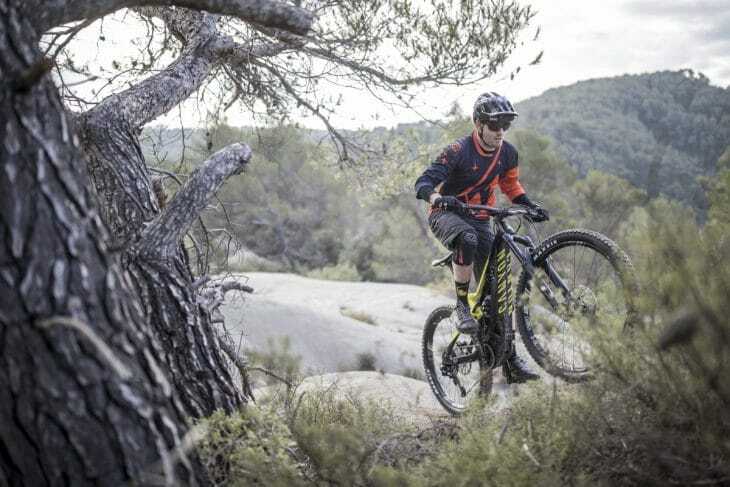 Canyon has certainly drawn on technology and many of the key features and characteristics of the conventional Spectral, but this chassis and suspension design is designed specifically around the Shimano STEPS power system. So, what makes it unique? 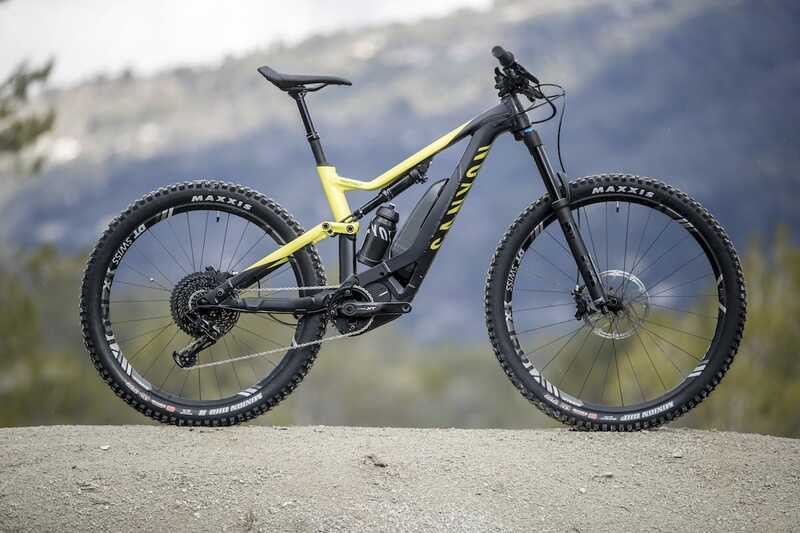 Canyon has put a lot of focus on the kinematics, with this bike utilising a similar suspension platform as the Sender downhill bike. 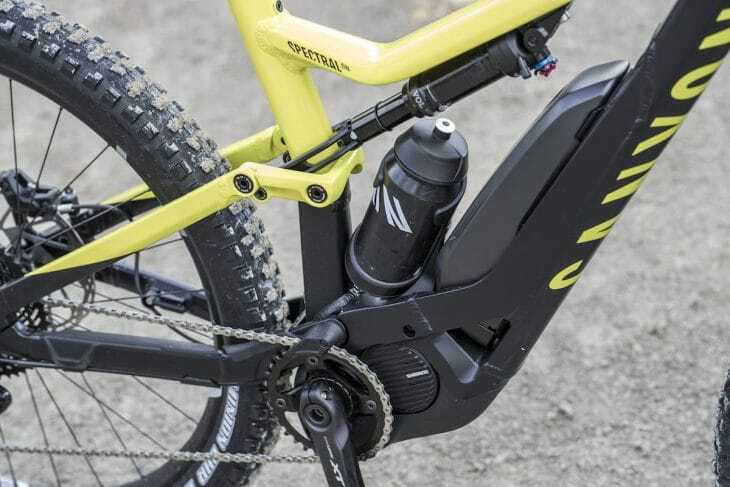 However, the suspension characteristics of an e-Bike differ from that of a conventional bike due to the added mass of the battery and motor, and of course the additional frame strengthening required to cope. 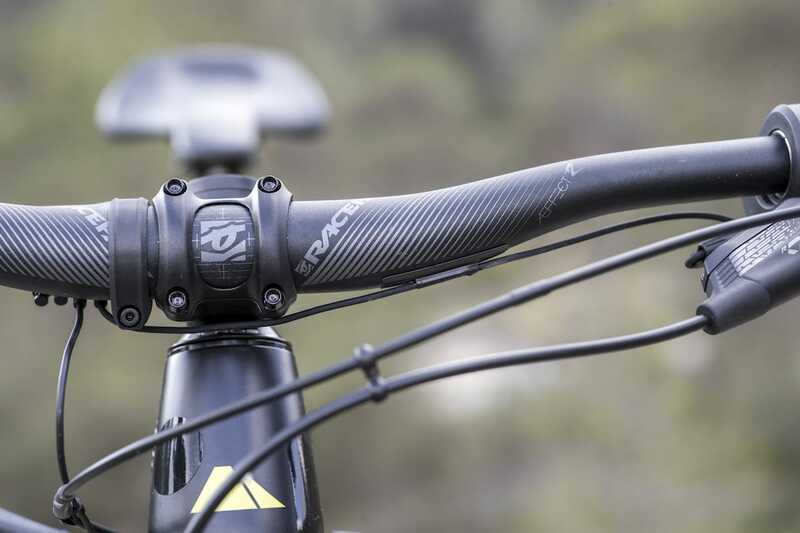 This means that Canyon had to rethink the kinematics in order to ensure that the bike retained the feel and playfulness that its design team desired. The ‘three-phase suspension’ concept of the regular Spectral is still there, which comprises of a sensitive beginning-stroke for traction and small-bump sensitivity, a stable platform in the mid-stroke for good pedalling performance and responsive handling, and sufficient progression at the end to help the suspension ramp-up before bottoming out. However, the 150mm of rear travel on the Spectral:ON is not only 10mm more overall than the non-E version of the Spectral, it also has more progression built in throughout the spring curve. This is necessary to stabilise the mid-stroke given the bike’s added weight. 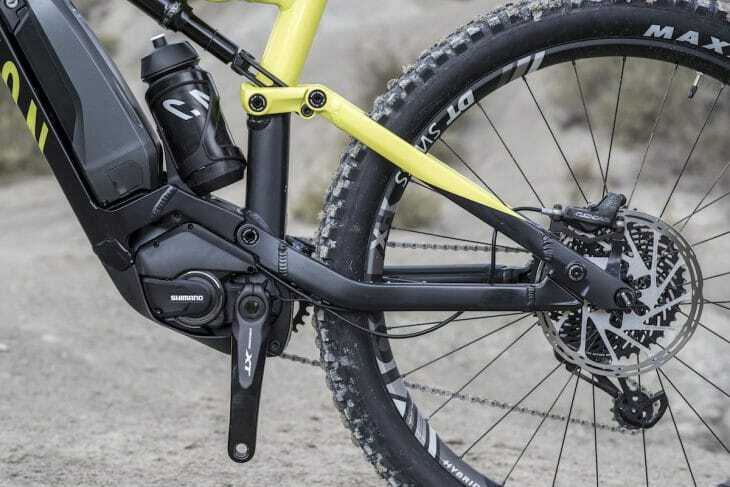 In addition to this, Canyon claims the Spectral:ON has a more consistent level of anti-squat throughout the travel, which is there to improve acceleration while the rider is seated – the idea being that you spend more time pedalling from the saddle on an e-MTB, rather than standing up on the pedals. Having started this project over two years ago, Canyon’s original designs were based around 27.5+ tyres. However, testing indicated that due to the additional power from the motor, those big-volume plus tyres didn’t give the right feel and accuracy in the steering. The answer? Canyon made the intriguing decision to mix up the wheelsizes. The result is a 27.5×2.8in rear tyre paired up to a 29×2.5in front tyre. Traction and comfort out back, with more stable and precise handling up front – apparently inspired by motorcross bike setups. And before you ask, the mainframe is specifically built around a 29in front wheel and fork, with the correct geometry to match. This isn’t a 29er wheel stuffed into a plus bike. The reach and the stack are set up as a 29er. The combination of the head angle and the front centre length is needed to create the stability for when the full mass of the bike is going fast and descending. This front-end stability has been paired up with short rear chainstays (430mm) to make the bike feel snappy, playful and to enable quick acceleration out of slow corners. Canyon understands that a longer chainstay length aids the climbing ability, but felt it was a compromise too far and it lost the feeling of fun and agility that it really wanted with this bike. Frame sizing is impressively from XS through to XL, with only the XS size ditching the 29in front wheel in favour of a twinned 27.5×2.6in setup. Also different on the smallest size is the use of a narrower 740mm wide bar to retain the same character and feel as the other size options. 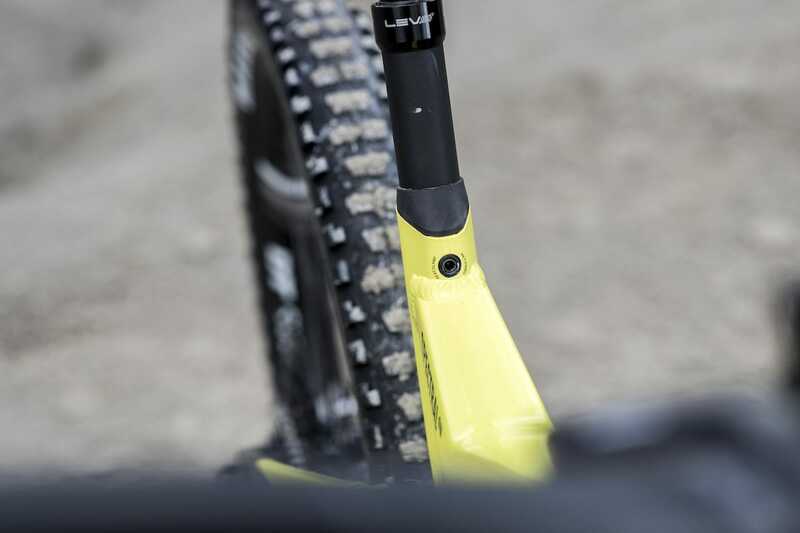 The geometry can be adjusted via a chip in the upper shock mount, which changes the bike’s bottom bracket height (10mm), the seat tube angle and the head angle to fine tune your bike for the desired rider height and for the trails you are riding. The standard setting is low and slack, which I stuck with for the duration of the day. One of the most important aspects of the design is the consideration of the drive motor and how it integrates into the frame. One of the reasons Canyon settled with the Shimano STEPS system is that it feels natural and it generates its power in the most natural way with a low pedal resistance. 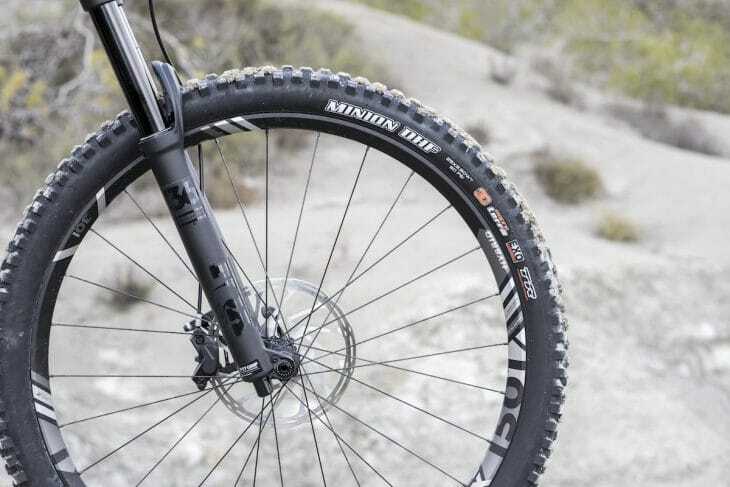 Canyon boasted that it gives the closest feel to an ordinary trail mountain bike. 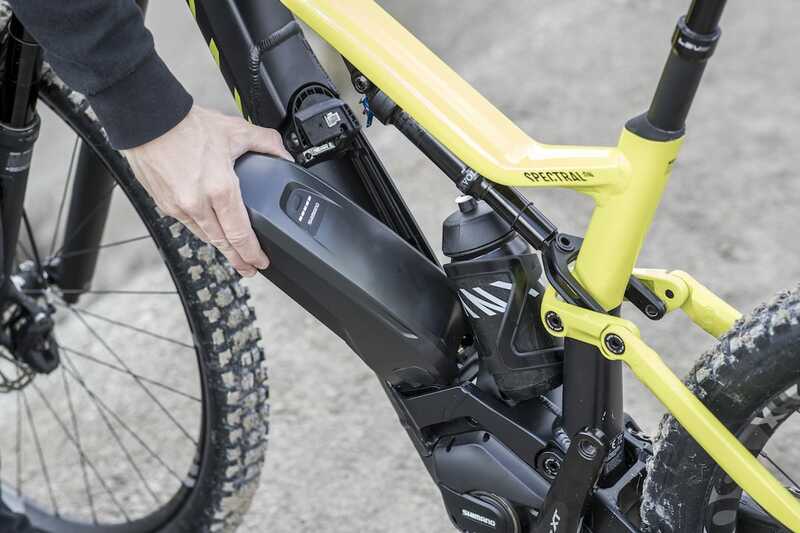 The STEPS system allows the general attitude of the whole bike to feel like a regular mountain bike. The 504Wh battery is mounted externally to the aluminium frame to save weight, as external mounted batteries are generally smaller and lighter than internal fully integrated designs. It also means the volume and the surface area of the frame is reduced. The choice to go with an external battery not only aids removal and loading but also access for general bike servicing. 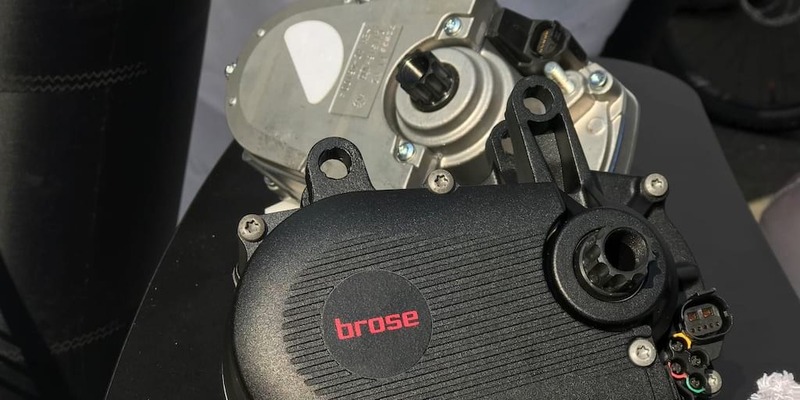 This practical design means that once you remove the battery there is easy access to the brake hose and cables as they run in a dedicated channel to one side of the battery. The cable routing is also nice and straight, resulting in a low friction route for gear cable operation. The frame design also allows for a neat specially designed floating bottle cage that allows you to carry a 500ml bottle on the bike. The cage is attached to the bike by two bolts fixed to the frame just above the motor. 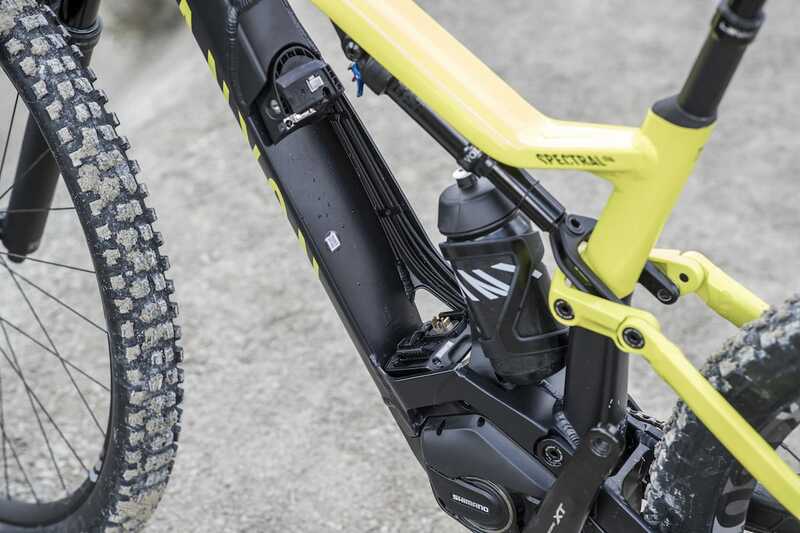 Under the Shimano motor there is a strong plastic protection casing that forms a skid plate to help slide over rocks and trail obstacles during technical climbing, similar to that of a trials motor bike. The plate has two rails with venting in between to reduce any risk of temperature build up from the motor underneath. The sealed integrated seat post clamp used is much like the Spectral sister bike. This reduces dropper post friction due to over tightening a conventional clamp on a small area of the post. The design is a plastic wedge that also does not scratch the post, and the sealing means it keeps dirt and debris out of the frame. Other features include an integrated chain guide with noise cancelling rubber inside, and a clever cable tunnel that doubles as the chain stay protector. The Spectral:ON 8.0 we rode comes with a bigger 160mm travel Fox 36. Copyright: Markus Greber. The bike I tested was the Spectral:ON 8.0 in a size large (which fitted my 5’10” frame perfectly). This model is the only bike in the lineup to feature 160mm forks up front. 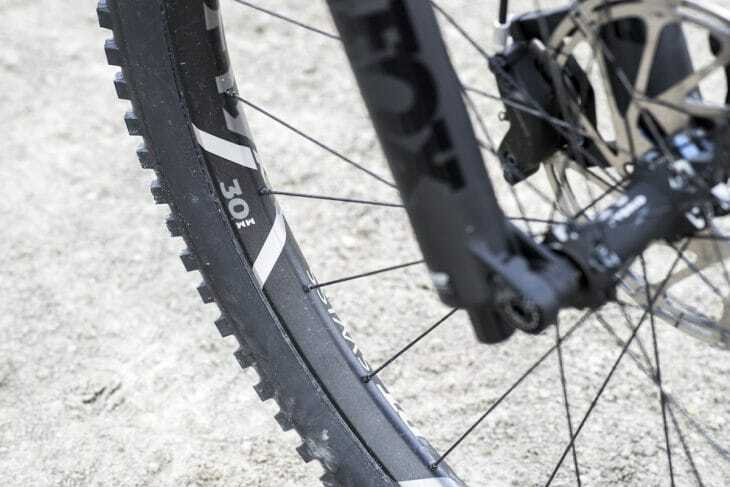 The rest of the range offers a balanced amount of 150mm travel front and rear. The bike is equipped with a SRAM EX1 8-speed drivetrain and dependable Code 1 brakes that are paired to big 200mm rotors to cope with the added weight and speed. The pick of the components includes a 150mm dropper post (on sizes M up to XL), a stiff fork with a minimum of 35mm chassis and broad 780mm bars. All bikes in the Spectral:ON range feature DT Swiss wheelsets and tyres with heavy casings. Featured components on the bike that I like include a saddle that has been specifically designed for the use with the e-bike. It features more padding and rear support with a rise at the rear for when the rider is climbing. 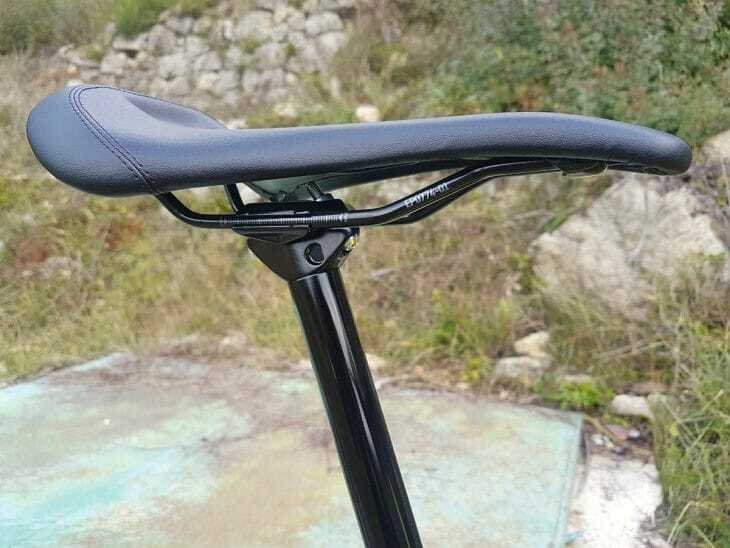 The saddle also features a wider nose that is angled down and longer rails than normal to fine tune your position on the bike. On the women’s bike the saddle has different padding to be more supportive and comfortable for the shape of the female rider. Another well thought out detail is the delivery packaging. Canyon has spent some time designing a box that protects the product so that it turns up at your door in the best possible condition. The robust box is also designed with un-packaging in mind too. In an Ikea style design, the Spectral:ON Bike Guard box comes apart in a way so that you won’t have to lift the bike up, out and over the box. The packaging is reusable and uses no tape to minimise plastic waste. This is a nice touch and shows the commitment from Canyon to perfect the direct sales experience for the end consumer. Having not spent a huge amount of time riding any e-bikes, I was excited about getting to know the new bike from Germany in the mountains with my own fresh look and perspective, and the hometown trails of Fabien really are something to behold. What the mountains of Provence lacked in elevation compared to their bigger ski resort brothers further North, they make up in features and variation. The trails were a mixture of steep technical rocks combined with narrow exposed climbing sections. Perfect to put the added power of the Spectral:ON to the test. The dreamy, mostly dry trail surface offered what felt like endless amounts of grip, particularly on the sandpaper like rock. The descents were varied, fast and open to narrow and technical and boy did the bike excel. I couldn’t help but grin from ear to ear and soon found myself whooping my way down the trails. I felt instantly comfortable once the bike was pointed downwards. The climbing was a slightly different story. The bike performed perfectly and I found myself challenging every one of the technical climbs. Unlike Fabien, I quickly realised I ran out of talent in this department, relentlessly attempting to attack the technical sections with speed and gusto. Many of the sections required a more calm and tactile approach, especially riding the trails blind. I found a trials-like approach was best in some circumstances, though I am no trials rider. The amount of times I had to dismount and push was frustrating, but I enjoyed the challenge and I didn’t give up. The only thing I found more frustrating was realising the Shimano STEPS motor had a walk mode within the last hour of the day’s ride. Whoops. Going up! Copyright: Markus Greber. It took some time for me to realise that using the power of the motor rather than relying on the gears was a better approach for me. Instead of remaining static on the bike, it was best to shift around to find the balance and the grip for the rear tyre. There is a definite technique to riding e-MTBs on technical climbs. The Spectral:ON in this kind of terrain is incredible. I chose to mix up the sections of climbing with a smattering of fire road ascents as well as Fabien’s technical climbs. The gravel fire road climbs were no real test for the bike and I soon found myself knocking the Shimano motor into Eco mode to conserve battery power and spin comfortably up without breaking a sweat. With the couple of planned stops on the ride I found it both convenient and most useable to stick in Trail mode for most of the day. It didn’t push the bike on too far and off the desired line and yet still packed enough of a punch to get you out of slower sections and back up to warp speed. This choice of power mode was probably made easier with the battery charge up at lunch and then a swap out later in the afternoon for a fresh full battery. The STEPS system feels smooth and intuitive in its power delivery. On the Shimano STEPS system itself, it does feel quite natural to use, and doesn’t feel so abrupt when the power cuts in and out – especially when the motor reaches the 17mph limit. The suspension feel is very similar to that of the new Spectral that I rode a few weeks ago. It gave a poppy and spritely feel to the bike despite the added size and weight of the motor, battery and the 29er front wheel. Overall I found it hard to not like. The bike descended like a juggernaut with the added mass. I found it easy to pick and hold a line even in the rough sections. Dean had to go back to find his dropped keys. Copyright: Markus Greber. I left the rear shock in the open mode during the whole day even on the steepest of climbs. This is a testament to how well the suspension design performs. Plenty of support, and it feels precise and neutral. The extra progression through the mid-stroke gives a direct feel and meant the bike tracked the ground really well giving plenty of feedback, allowing me to effectively pump the terrain. The Shimano display may be small and discrete, but it is bright and clear. I would say that whilst powering along trails like the ones I rode to test the bike, I rarely had chance to glance down at the display or the information so I’m not sure mountain bikers need to have the current speed displayed. Also, while the Shimano Di2-style shifter has a familiar feel to it, I think a smaller handle bar grip collar remote to control power modes would be a smart move so you could run an under-bar dropper post remote in its place instead. 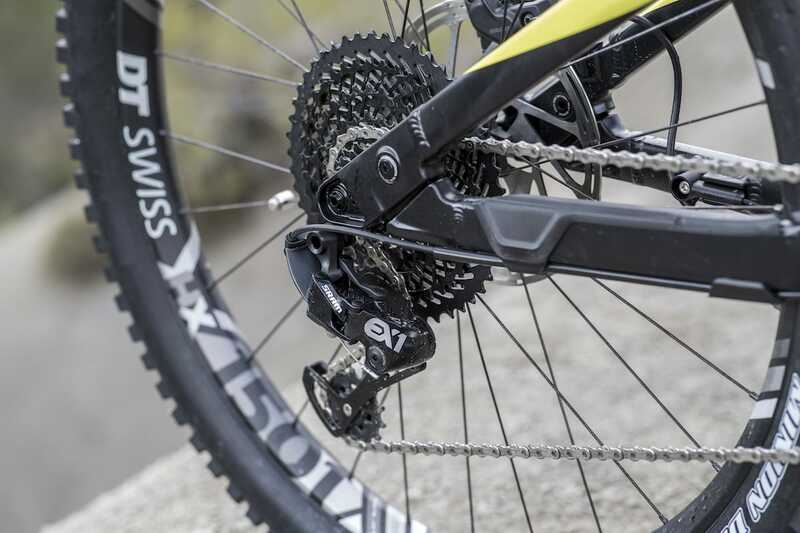 SRAM EX1 has 8-speeds of fury. Copyright: Markus Greber. The SRAM EX1 groupset is purpose built for E-mountain bikes, it was smooth and quiet and worked seamlessly during the day. The jumps in the 8-speed cassette was perfectly matched to the 34T chain ring and the Shimano motor. The Fox 36 fork coped perfectly with the added mass, showing little or no flex and combined with the wide handle bar and the 29in front wheel, just made this bike feel planted and secure offering bags of grip whilst descending. I loved the feel of the short rear end, and enjoyed the benefits of the smaller and wider rear tyre – especially during the insanely steep technical climbs. It egged me on to try and climb everything, even if I ran out of talent far too often. Even with the miss match wheel sizes the bike poses a beautiful balance. It’s not all quite high-fives. I’m not sure if the Canyon grips were particularly thin or a hard compound, maybe it was just me having to hold on to try to tame the beast, but my hands were sore come the end of the day. Also, the low bottom bracket meant pedal contact with the ground became common place and a little irritating despite the 165mm Shimano cranks. Perhaps something that the High geometry setting would be capable of solving. Stocky wheels and burly rubber complement the Spectral:ON well. Copyright: Markus Greber. The Spectral:ON 8.0 itself is a solid all-round package based around a natural feeling, quiet and solid performing Shimano motor. Quality full suspension e-MTBs don’t come cheap yet, although the lower models in the Canyon range offer great value for money all sharing the same frame and Shimano STEPS system. 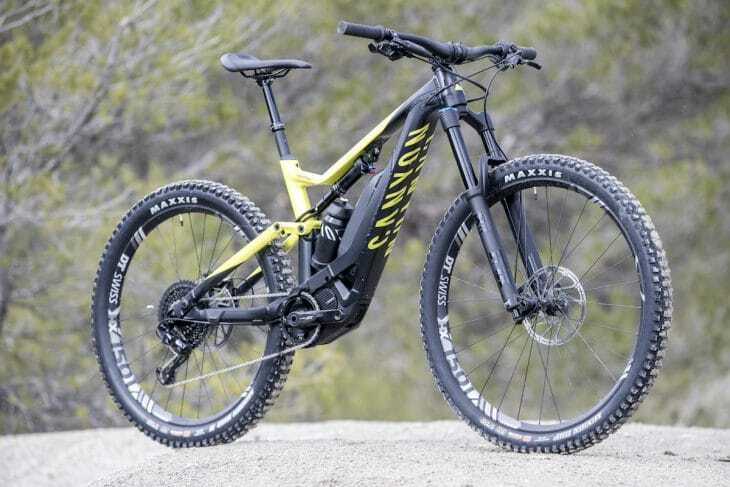 Canyon should be commended for having retained the playful ride quality of the regular Spectral with this e-MTB version. In particular though, I love the way the bike allows the rider to challenge themselves on the ups as well as the downs. It adds a whole other dimension to the experience, allowing me to ride trails in a totally different way to how I ever have before. Skirting around the obvious arguments for and against e-MTBs, my personal conclusion is that these bikes are amazing fun and I would argue that you are unlikely to meet anyone out on the trails riding one that isn’t beaming from ear to ear. 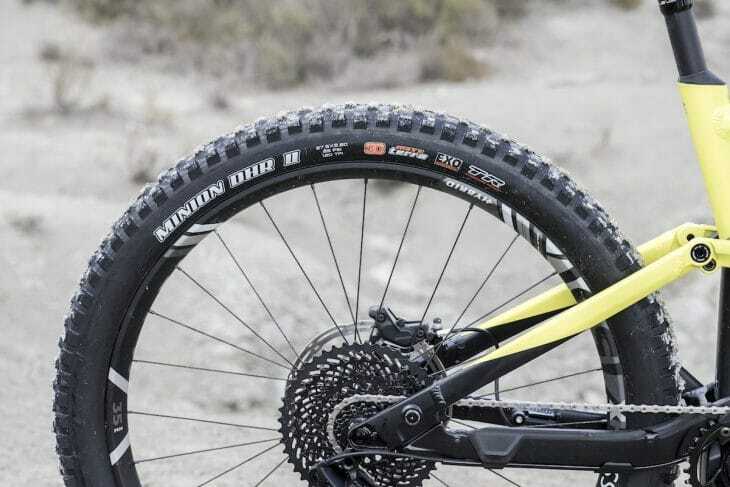 Canyon may be late to the e-Party, but it’s looking to lift the roof with the new Spectral:ON. Copyright: Markus Greber. Travel and accommodation costs were paid for by Canyon.